Miss Lemon is beside herself with anticipation. 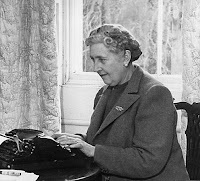 On the 3rd of September, little more than a week from now, HarperCollins will publish 73 of Agatha Christie's manuscript notebooks, complete with character sketches, plot outlines and scenes from her books, several of which don't appear in the published versions. Author John Curran came across this source material while sifting through papers that were once squirreled away at Greenway, one of Mrs. Christie's favourite seaside homes in Devon. Although the notebooks are not in fact as 'secret' as the publicity agents at HarperCollins might lead one to believe (two of Mrs. Christie's biographers, Janet Morgan and Laura Thompson, used them in their researches), Miss Lemon feels certain they will appeal to crime fiction fans far and wide. For at the very least, these notebooks contain clues to the creative processes of one the sharpest minds in British mystery history. Miss Lemon fears, however, that Mrs. Christie would be dismayed at the news that so excites her readers. She was a tremendously shy woman, who guarded her privacy fiercely. The journals, which are reported to be a collection of scraps, scribbles, and trial-and-error sketches, should in no way be mistaken for the coveted Christie method. Mrs. Christie was more the sort to take long walks and compose fiction in her head. She completed the first draft of The Mysterious Affair at Styles (1920) while wandering the craggy reaches of Dartmoor. As she progressed in her career, Mrs. Christie mapped out murders and talked out dialogue while scarcely ever setting pen to paper. In fact, Agatha Christie hated writing out her novels in longhand. She relied on the sage assistance of her personal secretary, Charlotte Fisher, to take shorthand. And by the 1930s and 40s, Agatha found herself 'writing' primarily by dictaphone. Even so, this in no way lessens Miss Lemon's eagerness to lay eyes on the notebooks, for the scarcity of Mrs. Christie's autograph manuscripts only increases their fascination. There is also the possibility, however remote, that some astute reader of this volume may discover the key to one of the most puzzling enigmas of the twentieth century: the creative genius of Agatha Christie. So exciting! And so interesting to learn about her process. Thanks, Miss Lemon!